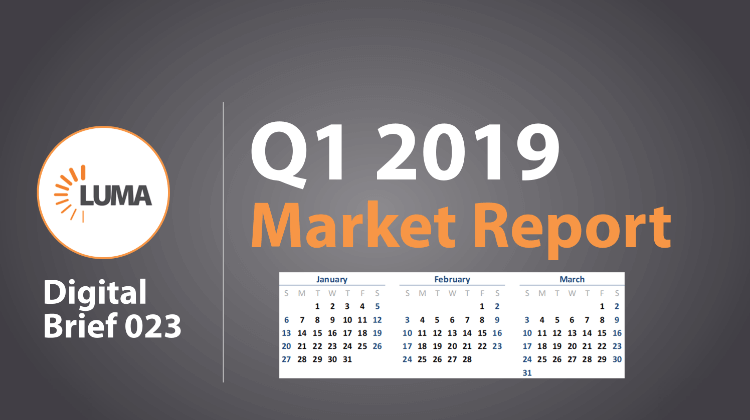 LUMA’s latest Market Report highlights the public and private markets during Q1 2019. It was a strong quarter overall with increases in both M&A activity and public market values. M&A deal volume was up across Ad Tech, MarTech, and Digital Content, and was capped off with the surprise acquisition of Dynamic Yield by McDonald’s; a rare marketer acquisition of technology that will bring the fast-food giant’s personalization efforts in-house. We also saw the last major national broadcast deal, Disney’s acquisition of Fox, close on March 20th, putting them and the other large content platforms in a prime position to invest in Convergent TV. Viacom made a step also in this direction, acquiring linear OTT streaming provider, Pluto TV, for $340MM in late January. In the public markets, both Ad Tech and MarTech companies saw significant growth, with all but one company increasing value throughout the quarter and at levels significantly above the broader market. Finally, in this Market Report, we are introducing a D2C Brand section, where we highlight some of the notable deals and fundraising rounds in this sector. Of particular note are the acquisitions of This is L. by Procter & Gamble for $100M and HotelTonight by Airbnb for approximately $400MM.